I'm still trying to swatch my entire nail polish stash. But I keep buying more polishes still and now I'm so freakin behind! Anyway, this is China Glaze's Flying Dragon which I believe was from their Ink collection. It's a neon polish and therefore for me it needs a shiny topcoat to complete the look. Flying Dragon is a gorgeous bright purple that just glows in the sunlight. Unfortunately I always have application issues with China Glaze (with the exception of Romantiques) and their neons are the worst. I still love the colours they make so I keep going back, lol! 3 Responses to "Flying Dragon"
That is a lovely purple! Do you find that, because of the glitter, this is gritty before a topcoat? 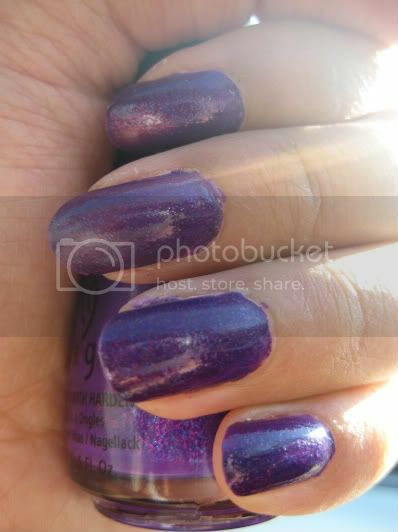 Shayla - I def find it kinda gritty so I need the top coat to make it look better. The only other ChG neon I have is Rose Among Thorns and that one isn't gritty, maybe because it's not glittery...I love Rose Among Thorns, one of my fave ChG's!